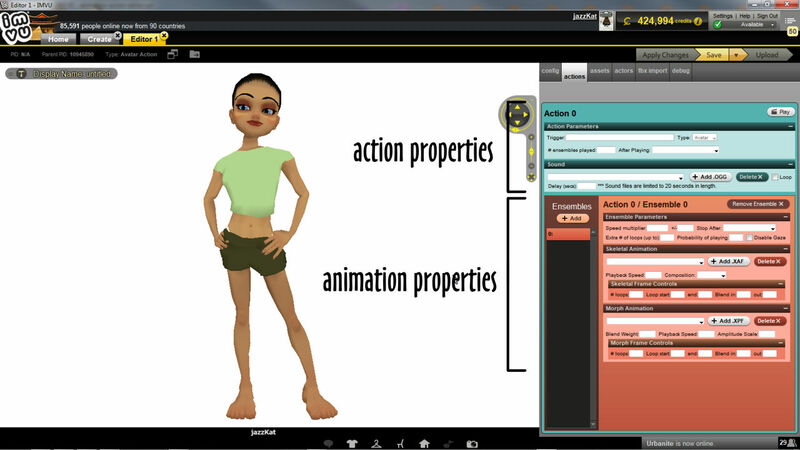 All products that animate need and Action, avatars are no different. 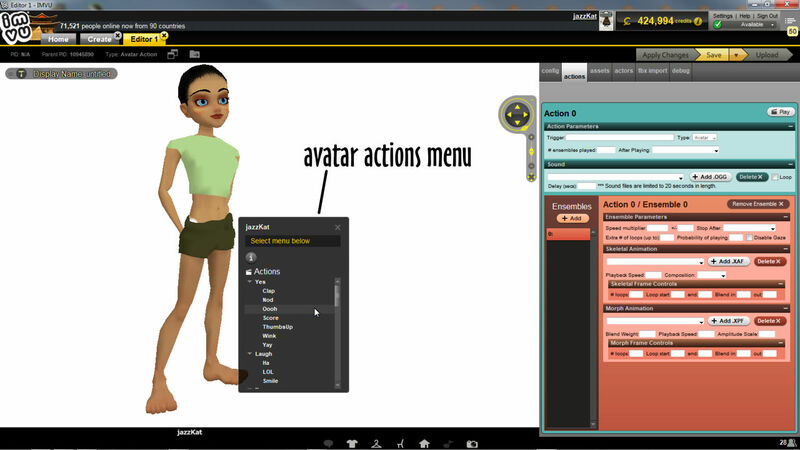 Avatar Actions then are where the various static and animated poses that avatars use are set-up and controlled. Here the avatar can be made to do something either on its own or with a parnter in an interactive couples pose. In this context, avatars, actions are animations specifically associated with avatars. IMVU’s allows great flexibility for the creation of static and animated poses for individual avatars or couples using the Action system. Actions are essentially optional animation and audio assets brought into a project to affect its behaviour or appearance, a couples pose for example, or a spinning top, would do little without a pose or animated sequence assigned to appropriate elements of each item. In other words, they add the visual aspect of IMVU’s interactive elements; when a seat or avatar spot is click something happens. Avatar Actions are generally accessed clicking the avatar itself to reveal the context menu listing the available choices, or by typing text into chat. Individual projects can include one or more Actions. Each Action can include one or more animations (ensembles). Animations can be selected repetitively, at random, or in sequence. One or more Actions can be triggered at the same time. Actions can be triggered automatically or by user input. Each Action can use a single audio file (multiple can be used across several individual Actions). Actions only affect the products they are assigned to. 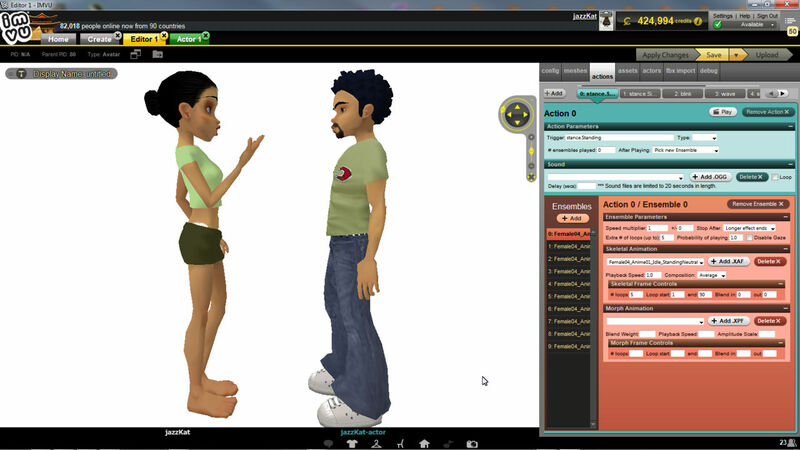 IMVU’s Action systems is governed by a few basic rules or conditions that can accommodate quite complex sequences involving multiple animations and sounds. There are two types of Action; automatically triggered Actions and manually triggered Actions. 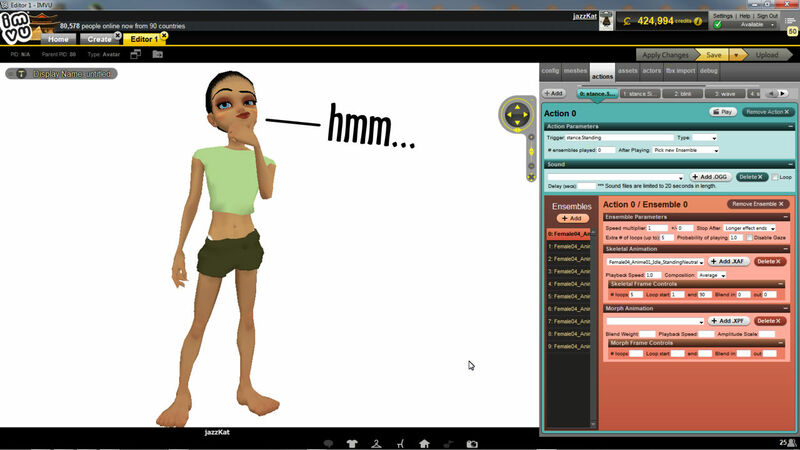 In practice this means avatars can perform actions based on whether they are triggered using the ‘stance’ triggers (automatic), stance.Sitting and stance.Standing, or words and phrases typed into chat (manual), e.g. “lol“, “burp” and so on. For example, if the avatar were to perform a cartwheel the trigger property in the editor would be set to “cartwheel” or similar, causing the avatar to animate and perform a cartwheel when typed in chat. For the animation to play when the avatar sits or stands the trigger is set to ‘stance.Sitting‘, ‘stance.Standing‘ or both depending on when the Action plays out. If the Action is to play when the avatar sits and stands two Actions will be needed each triggered using stance.Sitting or stance.Standing. Note also that using the stance. * triggers may not over-ride the default animations. If animations don’t play by default when the avatar sits or stands they can be triggered typing text into chat, ‘burp’ for example. Actions are assembled in the actions tab of a Create mode Editor. Here the basic properties controlling the overall Action, what triggers it etc., are established and the animation assets loaded. Adding a custom pose for example would mean stance. * set as the trigger, which activates a corresponding pose animation selected as the Skeletal Animation *.xaf, typically brought in during FBX import. More complex actions can be created utilising the additional settings and adding multiple animations to individual ensembles, the collection then controlled by the Actions overall properties. For more help using the Action editor click here. How the Action editor is actually used depends on the product being derived. The Action editor is divided into two sections; the upper generally controls the overall Action; the lower controls the assets associated with the Action. Avatar Actions generally have little to do with Blender other than using XAF skeletal and/or XPF shape key (morph) animations exported from Blender to FBX. So long as each type of animation has an Action in Blender, and the correct options are set on export, IMVU will import and use the tracks (sequences) it finds. For help exporting avatar animations from Blender click here. On export from Blender using FBX, so long as each animation sequence has an (Blender) Action, IMVU will use what’s imported (which appear as selectable items in the Skeletal Animation section).